Extract from listing printed in “High Roding: A Description of Buildings and life in the Village over the years.” by Mr W. E. Marston, 1982. House, late medieval and 17th century, with 19th and 20th century alterations. Timber-framed and plastered, with some exposed brickworks, roof tiled. 4 bays with 2 internal chimney stacks and external chimney stack on North East wall, circa 19th century. Small timber framed building to rear of North East end is circa 1700 or earlier. Stair tower and single storey extension to rear of south west end are circa 1961. 2 storeys. On ground floor: 4 20th century metal casement windows, 20th century door with imitation 19th century hood. First floor windows to be described later. Roof half-hipped at both ends. Two diagonal shafts, circa 1951, on south-west stack, one diagonal shaft, circa 1951, on North East stack. Some framing exposed internally. Stop-chamfered ceiling beams. The original building was a late medieval hall house. In the 17th century the walls were raised by about 1.5 metres and a clasped purlin roof built, re-using some of the smoke blackened medieval rafters. All of the original tiebeams are missing or revered, and little remains of the medieval structure; effectively it is 17th century with 19th and 20th century alterations. In the 19th century it was divided into 3 cottages, with extra stacks, stairs and floors. In or about 1951 the cottages were combined into one house. Some original floorboards were covered by modern softwood planking. Other alterations at the at time have seriously reduced the historical authenticity of the house, since the took the form of introducing building components of unknown provenance into a house in which they have no proper place, and imitating older styles which are not relevant to this building. A four-centred doorhead from elsewhere has been introduced over the south-west door in an impossible position historically. The south-west elevation has been treated with false framing and exposed modern brickwork in imitation of brick nogging (of which there is a genuine example at New Hall Farm, High Roding), historically inappropriate here. A rear stair tower has been framed with re-used timber in imitation of older work but without regard to traditional construction or proportion. Diagonal shafts in imitation of early 17th century chimneys have been built on 19th century stacks. One upper front window (the second from the south-west end) has been converted with 3 genuine ovolo mullions and a wrought iron casement from elsewhere in imitation of a late 16th century window, but all the components crudely fitted. Another upper front window (at the south-west end) has been similarly treated with imitation ovolo mullions, with imitation diamond glazing executed in obscured bathroom glass. The other 2 upper front windows are genuine late 17th century hardwood frames of 2 fixed lights and one wrought iron casement each and may be authentic in this house; but all the saddle bars of the fixed lights are missing, and windows designed for rectangular panes have been converted to imitation diamond glazing. More diamond glazing has been inserted in 20th century patent metal casement windows. Some of these alterations could still be reversed. The small bakehouse to the rear of the north-east end is of historical interest. 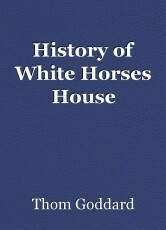 Mentions elsewhere as the public house “The White Horse” are dated 1854 and 1921.
you are all in danger!